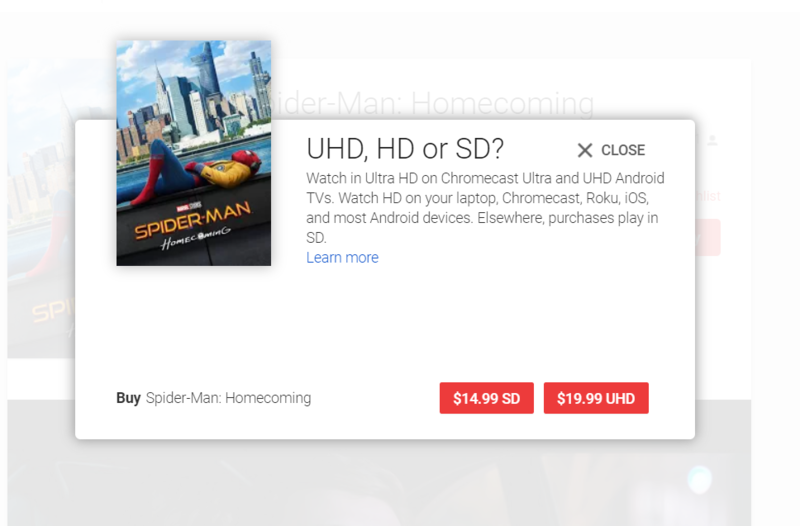 A number of new releases on Google Play Movies have seen their prices for UHD copies lowered substantially, and you've probably got Apple's new 4K version of Apple TV to thank. When Apple announced it would charge the same price for UHD as HD movies (with in-place upgrades - something Play is not offering, sadly), it was probably inevitable that other streaming movie platforms would see their prices drop, as well. Amazon's already doing it, so Play Movies is just playing catch-up here. Play Movies began offering 4K content a little over a year ago. While not all movies have had their pricing adjusted to the new scheme, you can probably expect that most major studios will make the switch over time, particularly when it comes to new releases. Films like Spiderman Homecoming and Baby Driver have already had their prices changed, with only options for SD and UHD available (UHD being at the old standard 1080p HD price). Now, Google - how about negotiating some free upgrades for those who already have content libraries in HD? That'd be... nice.